The author and his son at Top of the World crossing. As a 70th birthday present to myself, I fulfilled a life-long dream by motorcycling from Virginia to Alaska. Accompanied by my son Zeb, we fished our way North, ending up at Granite Tors Campground on the Chena River, 44 miles east of Fairbanks. We had loaded up our motorcycles and were headed for Denali National Park, but we needed gas. Riding on fumes, we coasted into the Pleasant Valley Store gas station at Mile J 23.4 Chena Hot Springs Road. (If we had been intelligent and had The MILEPOST with us, we would have known it was the last gas station heading into the Chena River State Recreation Area and filled up on our way in.) It was then that Divine Providence interrupted our plans with a journey to one of the coolest—literally and figuratively—places on Earth: The Chena Hot Springs Resort and the only year-round ice museum/hotel in the world, the Aurora Ice Palace (Editor: Both the resort and museum are also featured in The MILEPOST, had they but known!). An hour later, pulling our bikes up to the Resort’s office, I fully expected an Alaskan joke on two Lower 48 travelers. But this was no joke and what was to take place over the next 12 hours was surreal, like living in a dream. Bernie greeted us, checked us into a room, served us lunch with Jon and Jan, his friends who were there to work the resort’s annual renewable energy fair. After lunch, Bernie hustled us to the greenhouses, an integral part of the Chena Experience. The resort uses hydroponics to grow fresh vegetables. At dinner that night, a fresh salad was served with the tastiest Alaska salmon imaginable. Next, Bernie led us to an adjoining area where I experienced a Doc Brown Back to the Future moment. 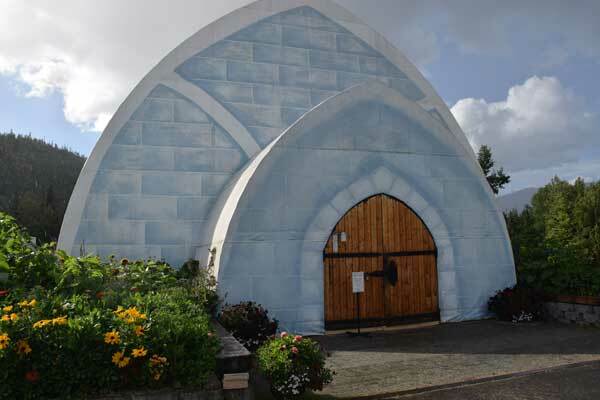 Here stood a one-of-a kind chiller utilizing cool spring water and heated geothermal water to provide year-round heat and electricity for the entire resort. 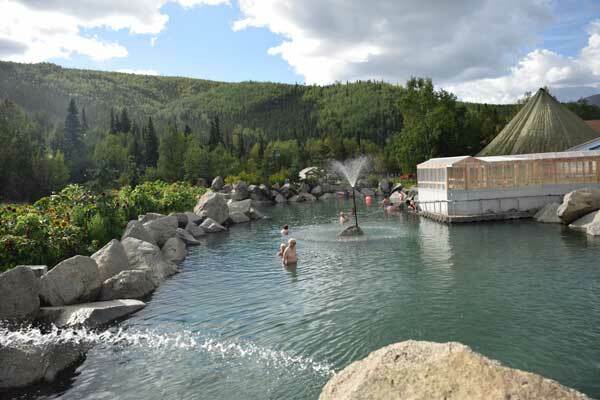 The temperature of the water from the Chena Hot Springs is the lowest from a geothermal resource to be used for commercial power production in the world. After this engineering marvel, we were outfitted with 4-wheelers for a Mother Nature tour of the resort. We raced around the grounds, up hills, through streams, observed beaver ponds and then stopped at the Huskie Kennels to interact with the dogs. Huskies used in the Iditarod? Was this happening? Pinch me, I thought. But, and a big but, what came next bombarded our senses, and I have never seen anything like it, before or since. We pulled up in front of a giant igloo. 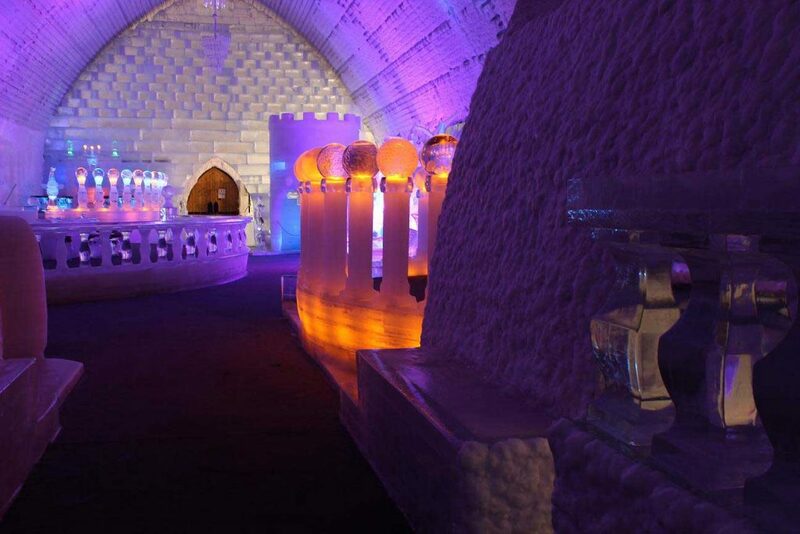 We were about to enter a twilight zone–the world’s only year-round Ice Museum and Hotel, The Aurora Ice Museum. We walked from the 80-plus degree summer heat outside into winter cold. The resort’s geothermal system refrigerates the interior to a constant 25˚F year-round. In the vestibule, we put on thick, hooded winter overcoats and walked into an icy wonderland of spectacularly lit ice sculptures in a rainbow of refractive color. We kept shaking our heads in disbelief as we absorbed the surreal setting. The Aurora Ice Museum is a collaborative effort between Bernie and Steve and Heather Brice, who have 23 World Championship Ice Carver trophies between them. A sample of the sculptures on display inside: The Coca-Cola Bear hovering over you; life-size knights on horses jousting; a Samurai defending himself; and a castle’s turreted staircase that leads to a balcony just waiting for Snow White to appear. 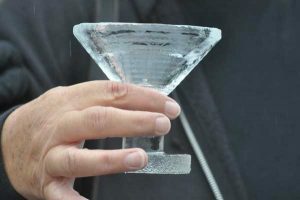 Another highlight was the ice bar, where we sat enthralled as Bernie entertained us with his Alaska history commentary while making us his signature Appletini, served in an ice carved martini glass. I kept looking at Zeb, smiling and shaking my head in disbelief, as we took it all in. 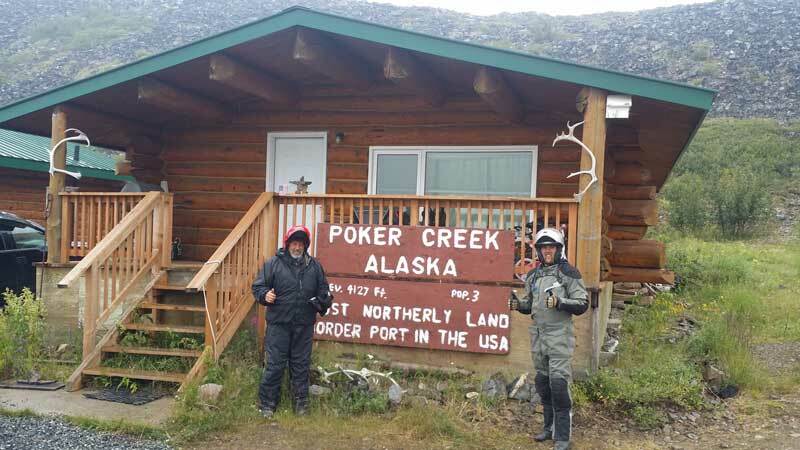 Zeb and I traveled more than 6,000 miles on motorcycles to get to Alaska. The experiences of the road were memorable, forever imprinted on our minds, but nothing impacted us more than the Aurora Ice Museum. It is an experience my son and I will share forever. A future goal of mine is to observe the Aurora Borealis dancing in the sky above as I soak in the Chena Hot Springs Resort pool some winter. But more than anything I want to sit on an ice stool again, feel the cold, look at those magnificent sculptures, and listen to Bernie’s stories as he makes me another Apple-Tini. Don’t miss it.